When you put the sugar in your coffee this morning, did you stop to think about where that sugar came from? I know I certainly never would have. Recently, however, I picked up a book by Elizabeth Abbott, a Toronto based writer. Her book Sugar: A Bittersweet History had me thinking twice, even three times, about that spoonful of sugar. Abbott's book, which was recently short-listed for the Charles Taylor Prize for Literary Non-Fiction, traces the history of the sugar industry. In the South Pacific creation legends exist in which a sugar cane sprouts a man and woman who found the human race, another tells of fishermen who keep catching a piece of sugar cane instead of fish and finally decide to plant the cane. It sprouts a woman who, with one of the fishermen, creates the human race. In the centuries before Christ, Buddhism taught of sugar's healing properties. Europeans discovered sugar cane while on crusades in Muslim territory, eventually learning how to cultivate cane and produce sugar. It was the Europeans who eventually started using slave labour to cultivate and harvest their sugar cane crops. As European nations colonizied many of the tropical areas of the world, that slave labour grew. Abbott plots out sugar's rise to popularity as a staple food item and reveals all the different nations and empires that used slave labour to harvest their crops. One would think that like many other medieval concepts, i.e. : feudalism and the selling of indulgences, sugar slavery would have also gone the way of the Dodo bird. Sadly, it did not. Abbott reveals in her book that this sugar slavery continues, even today. In many sugar cane producing nations people are working for next to nothing. They're also living on compounds provided by the owners of the plantation owners, sometimes without proper sanitation or access to medical care. They do it because it's still better than the alternative. 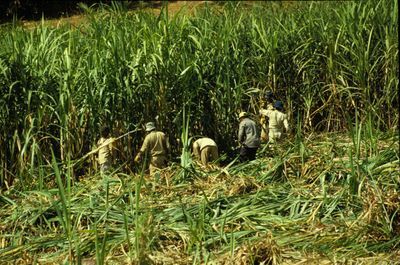 It's hard to find a comprehensive list from a reliable source of which nations harvest sugar cane under exploitative conditions. Some cases in particular have been brought to light, such as the Dominican Republic. Less than fair work contracts have been reported in Colombia, and children have been known to be exploited as cane cutters in Bolivia. I'm sure there are other cases to add to this list. The only cane producing nations that are not exploitative of their workers, as far as my research has shown, are Australia and Cuba. Australia because they have mechanized their harvesting process, and Cuba because one of the side effects of that type of government is that everyone gets the same wage. Reading about the conditions sugar cane cutters have lived and continue to live in struck me profoundly. I grew up hearing from my mother stories about the sugar cane plantations in northern Argentina, about how workers were sometimes paid in bags of sugar, or flour, about how the closest thing to medicare was a bottle of Ipecac. I grew up knowing that the only reason I am here today is because somewhere along the line one of my ancestors had slightly lighter skin, somehow learned how to read, and was able to pull themselves out of the dead end that is sugar cane cutting. Knowing that those conditions still exist stopped my sugar-laden spoon in mid voyage to my coffee cup. What to do? Well, Elizabeth Abbott has some good suggestions. Her first suggestion is simply stop using sugar. She points out that we simply do not need it. We know now, and the medical community has been telling us for some time, that our current levels of sugar consumption are helping the spread of obesity, diabetes, and other related diseases. The omnipresence of sugar in our foodstuffs is also recalibrating our palates in favour of sweetened foods. Do we really need sugar in our chicken soup? Any Italian housewife would disown the family member who dared put sugar in the tomato sauce. Although eliminating sugar would certainly change your taste palate and even your body shape, it can be hard to do. After all, sugar doesn't have to be evil. For those who just can't swallow black coffee, Abbott suggests seeking out Fair Trade sugar. Like Fair Trade coffee, the sugar come from small cooperatives where plantation owners and workers are able to negotiate for a fair price that allows for fair wages to be paid. No, you probably won't find this in your neighbourhood supermarket and it will cost more than the supermarket brand, but it's well worth it. Across Canada Fair Trade sugar can be found at all Ten Thousand Villages stores. Aside from that, many health food stores or bulk "dry goods" stores are now carrying Fair Trade sugar or can tell you where to find some in your area. For more information on how to find Fair Trade sugar visit: www.elizabethabbott.ca.